Growth of the packaging industry is the primary factor boosting the global gravure printing inks market. Expansion of transportation and packaging industries across the globe, especially in developing regions, and rise in industrialization are augmenting the global gravure printing inks market. Gravure printing inks can be used in printing materials such as polyester, oriented polypropylene (OPP), nylon, and polyethylene (PE). This is also a key factor boosting the demand for gravure printing inks. Gravure is a preferred printing process in the packaging industry due to its ability to print on thin films such as polyester, nylon, and polyethylene. This is estimated to fuel the demand for gravure printing inks across the globe in the next few years. Certain regions in the world have enacted environmental regulations regarding emission of volatile organic compounds (VOC) from solvent-based printing inks. Several countries around the globe are increasing the usage of water-based inks in various printing applications in order to comply with these environmental regulations. Led by their sustainability, gravure inks are replacing solvent-based inks in various applications. Flexographic printing inks have been rapidly supplanting traditional gravure printing inks. This is expected to act as a major factor restraining the gravure printing inks market. Flexographic printing is replacing conventional gravure printing in many regions, as these inks consume less ink, require less manpower, and have fast changeover. Demand for flexographic inks in several countries in North America and Europe has increased in the last few years. This is hampering the gravure printing inks market in these regions. The global gravure printing inks market has been segmented based on resin, technology, application, and region. In terms of resin, the market has been segregated into nitrocellulose, polyamide, polyurethane, acrylic, and others (including polyester, maleic, ketonic, and polyvinyl). The nitrocellulose segment dominated the gravure printing inks market in 2017. Nitrocellulose is a basic substance used for ink formulations in the mono- and bi-components form. The material is significantly used due to its advantages such as easy drying; film forming ability; low cost; heat resistance; solubility in alcohol-ethers mixtures, ketones, and esters; and dilatability in hydrocarbons. It has low odor, good degree of dimensional stability, and limited resistance to acids and alkalis. Based on technology, the global gravure printing inks market has been classified into water-based, solvent-based, and others (including UV-curable). Solvent-based gravure printing inks are among the widely used gravure inks in the world. This can be primarily ascribed to their ability to dry quickly and ease of adaptation on various substrates. On the other hand, water-based gravure printing inks are gaining momentum, as these inks comply with several environmental regulations. In terms of region, the global gravure printing inks market has been divided into North America, Europe, Asia Pacific, Latin America, and Middle East & Africa. 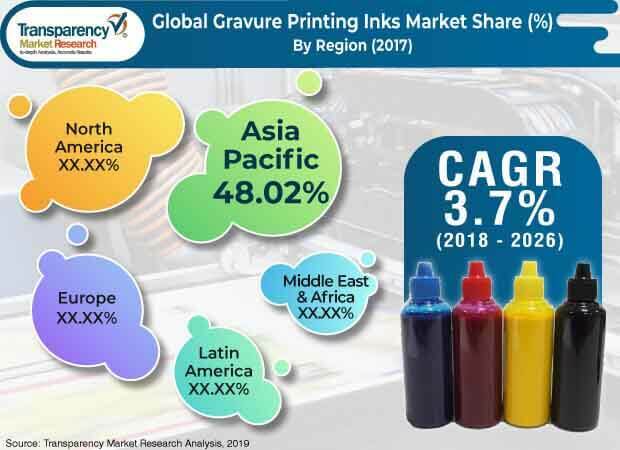 The gravure printing inks market in Asia Pacific is projected to expand significantly during the forecast period owing to the growth in lamination and food packaging industries in the region. Increase in demand for processed and canned food in emerging countries such as China and India is likely to positively impact the market in the region. Rise in disposable income has augmented the demand for interior designing with customized wallpapers. This is slated to drive the demand for gravure printing inks. Europe is anticipated to remain a key regional market owing to the rise in demand for commercial printing in the region. The gravure printing inks market in North America is expected to expand significantly during the forecast period due to the technological advancements in these inks. High degree of competition exists among players operating in the global gravure printing inks market. The market is dominated by a few major players and is moderately consolidated. Prominent players operating in the market include Flint Group, DIC Corporation, Tokyo Printing Ink MFG Co. Ltd., Sakata Inx Corporation, Siegwerk Druckfarben Ag & Co. KGAA, Hubergroup Deutschland GmbH, Dainichiseika Color & Chemicals Mfg. Co., Ltd., and Wikoff Color Corporation.